April 25, 2014: NASA's Wide-field Infrared Survey Explorer (WISE) and Spitzer Space Telescope have discovered what appears to be the coldest "brown dwarf" known -- a dim, star-like body that surprisingly is as frosty as Earth's North Pole. Named "WISE J085510.83-071442.5," the brown dwarf appears to be 7.2 light-years away, earning it the title for fourth closest system to our sun. "It's very exciting to discover a new neighbor of our solar system that is so close," said Kevin Luhman, an astronomer at Pennsylvania State University's Center for Exoplanets and Habitable Worlds, University Park. 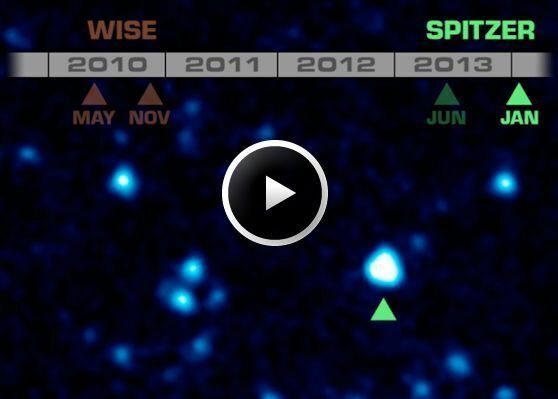 This animation shows the brown dwarf WISE J085510.83-071442.5 moving across the sky. It was first seen in two infrared images taken six months apart in 2010 by NASA's Wide-field Infrared Survey Explorer (WISE). Two additional images of the object were taken with NASA's Spitzer Space Telescope in 2013 and 2014. All four images were used to measure the distance to the object -- 7.2 light-years -- using the parallax effect. "It is remarkable that even after many decades of studying the sky, we still do not have a complete inventory of the sun's nearest neighbors," added Michael Werner, the project scientist for Spitzer at NASA's Jet Propulsion Laboratory. "This exciting new result demonstrates the power of exploring the universe using new tools, such as the infrared eyes of WISE and Spitzer." After noticing the fast motion of WISE J085510.83-071442.5, Luhman spent time analyzing additional images taken with Spitzer and the Gemini South telescope on Cerro Pachon in Chile. Spitzer's infrared observations helped determine the frosty temperature of the brown dwarf. Combined detections from WISE and Spitzer, taken from different positions around the sun, revealed the object's parallax, and thus its distance. 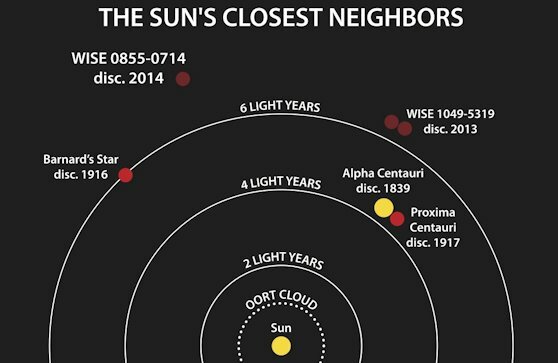 The closest system to Earth, a trio of stars, is Alpha Centauri, at about 4 light-years away. WISE J085510.83-071442.5 is only a few light years farther than that. WISE J085510.83-071442.5 appears to be 3 to 10 times the mass of Jupiter. With such a low mass, it could be a gas giant similar to Jupiter that was ejected from its star system. But scientists estimate it is probably a brown dwarf rather than a planet since brown dwarfs are known to be fairly common. If so, it is one of the least massive brown dwarfs known.